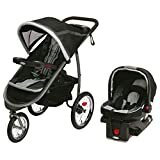 Jogging strollers are a great way for post-partum moms to get back into shape and offer a way to take your newborn with you anywhere you want. These versatile strollers are designed to offer more flexibility then standard strollers seen with three wheels, handbrake and larger tires. 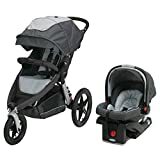 These features make these strollers suitable for running and typically add in other features like under-carriage storage, cup holders and more for added convenience. The trend of staying in shape has taken on a whole new meaning for moms with factors making it more convenient then its ever been before. Some say jogging strollers are the only stroller you’ll need, and with names like Joovy, Graco, Baby Trend and many more, we tend to agree. The following review details the Top 5 Jogging Strollers in 2018 as we’ve considered everything from the consumer’s perspective. 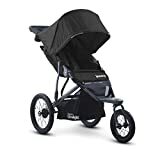 The Gotham fastaction jogging stroller from Graco has become a top-seller with over 400 satisfied customers on Amazon. The Graco brand speaks for itself and this jogger has it all including exceptional build quality, an amazing price, and features you typically don’t see in a stroller at this price. Adding more versatility including the ability to connect with other Graco products including car seats with a simple one touch attachments that’s super-easy. The Gotham Fastaction Jogger is affordably priced and is a three-wheeled model with air filled tires. The suspension offers more comfort then most making it suitable for long jogs through the park. Onboard you’ll find a front swivel wheels that locks, parents tray for storage, 2 cup holders, and another storage compartment that’s covered. The Joovy Zoom is a simple jogging stroller available in a black finish that offers everything you need for storage and jogging in one. This simple solution for moms to get back in shape is affordably priced making it a top-choice for those on a budget. Thanks to the extra-wide seat, your baby gets a clear view of their surroundings helping keep them entertained for the entire ride. Notable features include an included tire pump, suspension with shock absorbers, 16-inch tires, wider 12.5-inch front swivel tire, storage tray and running leash so it doesn’t get away. The compact, lightweight size makes it highly portable and with a simple fold and unfold operation it’s easy for anyone to use. Thule may not be a brand you’re familiar with, but you should be. Since entering the stroller industry they’ve managed to garner quite a reputation in a small amount of time. The quality that we’ve seen is second to none leaving little doubt in durability, value and performance. 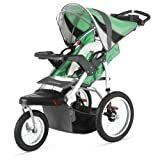 This urban gliding jogging stroller has it all and is available in five models including one that’s slightly more, but includes a carrying bag. The Thule Urban Glide Jogger is an exceptional value, although it comes in at the higher end of the price range. Highlight features include a locking front wheel that swivels for ease of maneuvering. The handlebar is adjustable offering parent’s improved ergonomics which bodes well for long jogs in comfort. For simple folding it only takes one hand and functions as a travel system with a compatible car seat holder. The Glacier from Graco has been around for a couple of years, but like aged wine the refinements just keep getting better and better. Graco put a lot into this 2016 model that’s significantly improved on safety, comfort and convenience making it a top-choice for jogging moms and dads. It’s ease of use extends to the simple folding operation that literally takes 1-second. The Glacier jogging stroller makes it a perfect travel companion and will become the only stroller you need. Outfitted with a suspension system that improves the overall ride quality complete with large pneumatic tires. One of the biggest pros it the ease of maneuverability which users have stated which comes in like that of standard strollers with much smaller tires. The Schwinn Turismo is another amazing value with an affordable price coming in around $150 which is significantly less than comparable models. Schwinn is another brand that speaks volumes and this jogger is available in three color options including green/black, blue/grey, and blue/grey. The lightweight frame is made of an aluminum alloy making it compact and easy to take with you. The Turismo is a folding jogger and improves safety with a dual trigger folding operation. Onboard you’ll find dual cup holders, molded tray for parents, flip up tray for your child and even speakers mounted in the canopy which allows you to hook up your MP3 player or smartphone for music while you jog. The ultimate jogging stroller for parents adds in even more convenience which is compatible with numerous car seats from other manufacturers. 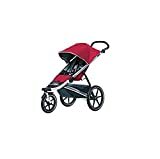 When looking at the top jogging strollers available this year it’s easy to see why they’ve become so popular. When looking to get in fit while enjoying the great outdoors, there’s no better way to get the best of both worlds then from what you see here. If you have any questions or something to add, be sure to leave us a comment below.